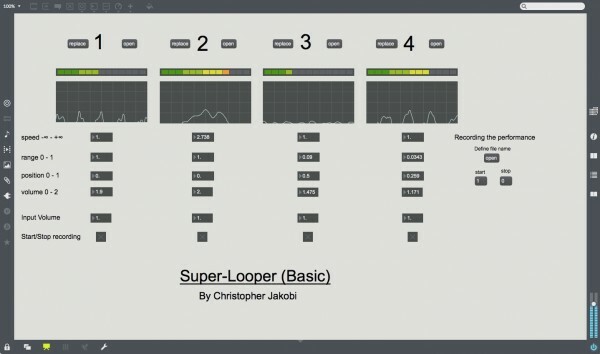 A lot of people asked me for my "Super-Looper" Max/MSP-patch, so I decided to build a version, that everybody can use without any additional controllers. After switching to presentation mode, this basic version has all controls on the surface. The full version is completely controlled via a total of about 200 Midi CC messages, so you will need some kind of hardware controller. If you want to give the full version a try, just contact me and ask for it. Please feel free to leave a comment, if you like the patch! you are both a gentleman and a scholar. The way you program is beautifully concise...! Can i try the full version patch?